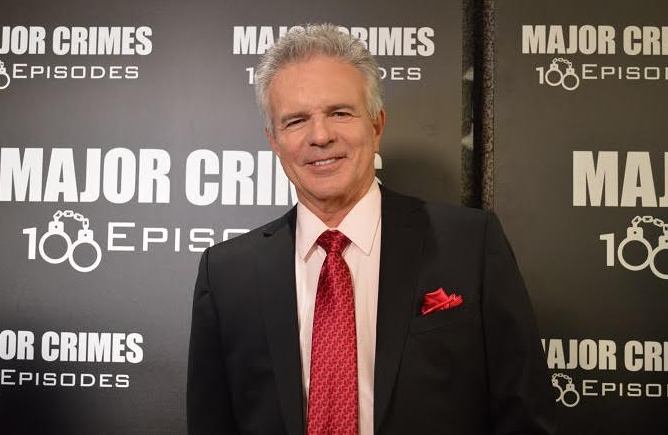 We’re here with the second edition of our Major Crimes month article series, where we’re presenting a new interview every week day with a familiar face from the TNT series. Today, the focus is on none other than Tony Denison, the man responsible for playing Andy Flynn both on this series and The Closer. He’s had a tremendous run on the series and has hooked us into so many wonderful storylines. Andy’s relationship with (and now engagement to) Sharon Raydor is so popular, that they are the reigning champions of our 2017 Crime Dynamic Duos Tournament here at CarterMatt. We of course touched on this in our interview with Denison and a number of other topics pertaining to the 13 new Major Crimes episodes starting on Tuesday, October 31. (This interview took place during the 100th episode party red carpet this past weekend in Los Angeles in which we were in attendance). CarterMatt – Tens of thousands of people voted for Andy and Sharon to win the CarterMatt Crime Dynamic Duos – they’ve gotten a lot of support! Have you felt that love over the years, especially this past week? This is such a strange time to be [having this party given the cancellation news], but there is still a lot to celebrate with 100 episodes, or 200 episodes [with The Closer factored in]. It’s amazing, and as far as what happens after this, you never know. As far as my life is concerned I’ve got a lot of irons in the fire, but I think it would be presumptuous to speak about them. As soon as I say ‘I’ve got this thing coming up’ and then it doesn’t happen, I’ve got everybody [upset]. Since you are one of the Dynamic Duos winners, I do have to ask — for Sharon and Andy, what’s the wedding going to be like? Is it going to be happy? I can just tell you this about the wedding — when she walks down the aisle she literally looked like an angel with the way that they lit her. She was gorgeous in so many different ways, and Mary herself is gorgeous in so many different ways. I’ve loved working with her. We have seen the team tested many times over the years, so what does season 6 do to challenge everyone yet again and surprise the audience? I don’t know how much I can give away, but I can say that it’s going to be fantastic. Want more Major Crimes news and interviews? The most-recent one we posted is with Jonathan Del Arco (Dr. Morales), and you can check that one out over at the link here. Tomorrow’s interview with be with none other than Michael Paul Chan (Michael Tao)! Look out for that and more Major Crimes interviews every weekday for the next few weeks. And TNT is giving up ratings and loyal viewers for what? Criminal winning? Many of us out here in Flyover Land are fed-up with the bad guys winning and corruption. We let ourselves get lost in a good drama and engaging characters for a reason. It’s going to be a very long, cold summer before I watch TNT “We Know Drama” again. They think they know drama, but what they don’t know is a loyal fan base which just evaporated.